On January 28, 2016, 19 year old Christopher Kalonji was shot and killed by police in Oak Grove, Oregon. Christopher was a young man interested in history and social justice. He used art to express himself, and practiced martial arts; he was also an exceptional critical thinker and intellectual, he was a loving son, and he suffered from mental illness - in the months before his death, Christopher has begun showing signs of paranoia, anxiety, and depression. Christopher’s symptoms came to a head in late January. In the early hours of the 28th Chris began panicking, telling his mother that he was too terrified to bring himself to attend a scheduled court date in downtown Portland. Christopher was hysteric, explaining that he was being watched by the police, claiming that they had been following him over the past few days. In Christopher’s reality, officers were out to get him because of his staunch political views around police accountability and his individual rights. As the day wound on, Christopher’s condition did not improve. At about 7:30 AM, Christopher’s mother began calling loved ones and family friends that she thought could help deescalate the situation. No one, not a retired police officer and long-time friend of Christopher's, his father, nor his martial arts coach could seem to reach him. At this point it was becoming clear that Christopher was in the middle of a full blown mental health crisis. At the next mention of his court date, Christopher broke down, locked himself in his room, and called 911 in a panic. At 8:15 AM the Clackamas County Police arrived and severed all contact between Christopher and his family. As the family was escorted away, they saw that Christopher sitting in his bedroom window, naked. It was clear that he had no weapons on him, nor any place to conceal them.The officers continued to communicate with Christopher for 3 more hours, his family kept at a distance. Around 11:20am the family heard three loud sounds - tear gas, the police claimed. Christopher was bleeding to death in his room, unbeknownst to his family. Christopher’s family was then transported to the Sheriff’s office where they were denied any information about Christopher’s state. They had no idea if their son was injured or dead. While at the Sheriff’s office the family was separated to conduct interviews that they were told would assist the police in negotiating with Christopher. Antoine Kalonji, Christopher’s father, was denied a translator despite his multiple requests for one. Hours later, at 4:30 PM, Christopher’s mother was given the news she dreaded, her son was dead, those noises she had heard earlier in the day were in fact gunshots, she had been lied to. The family was allowed to leave the office and head to OHSU where they were informed by a doctor that Christopher had died due to a loss of blood. To make matters worse, the police had waited hours before entering Christopher’s room after shooting him. Had he been taken to the hospital earlier, they were told, he may have survived. The Kalonji's feels that the officers in charge on scene were grossly negligent, ignored their repeated pleas for a mental health response team, and were quick to use force before all other options were exhausted. The family is currently working with the NAACP of Oregon, the Mental Health Association of Portland, as well as Don’t Shoot Portland and Black Lives Matter PDX to try to achieve justice for their son. They have filed a Tort Claims Notice against the County as well as several filings to try to assist the family with the costs they are being asked to pay associated with the damage caused by the SWAT response. 1. 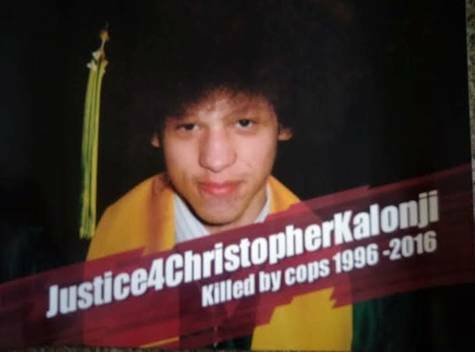 Ask that an outside agency conduct a meaningful investigation into who made the decision to shoot and kill Christopher Kalonji. 2. Demand Clackamas County Police Department invest in Training, Screening, and Improved Cultural Training, as well as Bias Training. 3. Charge the two officers, Sergeant Tony Killinger and Deputy Lon Steinhauer with criminal homicide. 4. Demand that government agencies push for reform of all police departments so that all citizens feel safe and are not discriminated against.